Our wild, warm wind–le vent d’autan–is into its second day. It can last days yet–a week even. It’s particularly violent this time. We drove back from an evening in Toulouse last night gingerly, dodging the big “kindling” strewn across the road. Birds are flying low to the ground, not to be blown off course. I find this wind troubling–but it’s shaking the walnuts off the trees–and they are ready. Intrepidly (!) I braved the tempest this morning and returned with three bags full! I may have enough for the year now. Walnuts are good for you and feature regularly here on pasta, on aubergines and for breakfast. When we arrived home last night, windblown but safe, a fairy had visited bearing gifts. A round cheese with Fromage de Brebis Corse (corsican sheep’s cheese) written in white ink on the small brown bag and another brown bag with Trompettes de la “Mort”—[delicieux dans les pates”]–(wonderful on pasta)] written in the same white ink. Thierry and Flo–our neighbours–returned from ten days holiday on the Beautiful Isle (Corsica) with things they knew we’d like. What to do with the spookily named fungus? 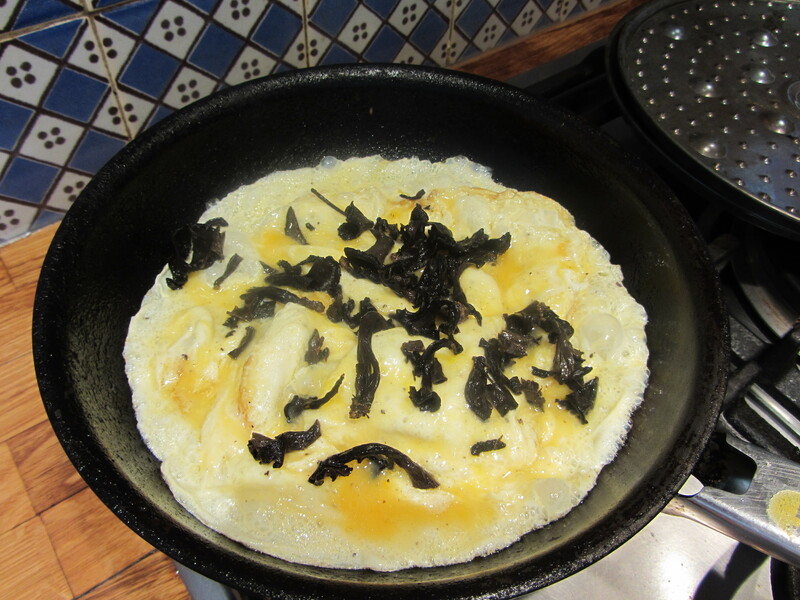 For the little darkly-named trompettes, I settled on “deadly” omelettes–black on yellow. Where is the “Beautiful Isle”? Is that Shakespeare’s “scepter’d isle”? Corsica–I should have bracketed it in–the French call it this. Some of my favourite things. Mushrooms and walnuts! Such versatile ingredients. GO FOR IT ROBIN! I am looking forward to you posting some fabulous recipies with these ingredients! BTW, my Grandpa knew how to hunt for wild mushrooms that positively would NOT kill you! He learned that ancient skill from his Bavarian parents. I have seen some REALLY FUNKY HUGE mushrooms in my backyard- however, I have decided instead to go to the local grocery store. I love mushrooms sauteed with Olive Oil a bit of garlic and sherry! Start planning and cooking! Nothing better than a mushroom omelet. Yummy! p.s. You have some fabulous friends over there! Just had a wonderful shitaki and crimini Goat cheese Pizza with truffle oil from PIZZALINA in San Rafael CA and it was to die for. Walnuts would have been just too much but I might suggest it! That omelette looks very good. Sounds good, but I am not sure I am brave enough to try anything called “Trompettes de la Mort”. Too ominous. Saw just on the news south east france has floods, hope your o.k.Hughs Chantal. I was able to fill my other half in on what you were doing now. “How do you know all this?” he asked gobsmacked. I had to confess I had found link to your blog on a chicken website I frequent. Walnut allergy is an uncommon type of food allergy. All of us have heard of the well publicized peanut allergy. You might even have heard of milk and gluten allergies. But walnut allergy? Not so much. Because of the relative scarcity of reported cases of walnut allergy, it has been grouped all together with other tree nuts. However, the few who do have this allergy are thirsty for more information. This article provides a concise review on walnut allergy and its causes, diagnosis, and treatment.. Your wild, wet wind is like LA area’s Santa Ana winds, which are usually dry. If you have California Pepper trees, eucalyptus, or palm trees with dried-out fronds, you can be sure of them scattered ll over–only problem is that the first two have heavy branches that damage property (cars especially, as too many of them are “street trees” in residential areas) or kill anyone under them when they fall. I adore mushrooms in anything cooked, especially omelettes.